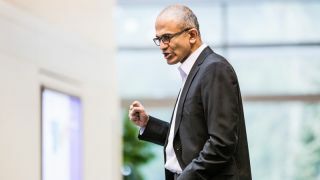 Yesterday Microsoft CEO Satya Nadella told a room full of women - at a conference dedicated to advancing women in the male-dominated tech industry no less - not to ask for a raise. He said "karma" and "trusting the system" will ensure that they are paid fairly. That's coming from a man who will be making $18 million this year. Now, UltraViolet, our organization, is asking Microsoft to fire Satya Nadella and replace him with a CEO who will help close the gender wage gap, not just tell women to wait their turn for a raise. Despite the many advances we've made, women still make only 78 cents for every dollar a man earns - across all industries. That's not a joke, it's a real burden that families grapple with. That problem is exacerbated in the tech industry where women are horribly under-represented. Under pressure, Satya Nadella is trying to walk back his words. But apologies without action mean nothing. The truth is: Microsoft is a behemoth that sets a standard for one of the country's most important industries. It's also way behind the times. While it's not a secret that the tech industry notoriously underpays and under-employs women, and that it has been riddled with accusations of sexism, discrimination, and harassment - Microsoft has been particularly bad. At Microsoft less than a third of employees are women. The leadership is overwhelmingly male. The company lags in paid family leave policies that would spur greater equality - while some companies like Facebook, Instagram, and Reddit offer 17 weeks of maternity and paternity leave, Microsoft is light-years behind with only four weeks of paternity leave and 12 weeks for new moms. But Nadella's solution to the gender wage gap seems to be for us ladies to just trust in the system, despite the fact that the system is obviously broken. If Nadella were paying attention he might note that the gender wage gap amounts to nearly $450,000 in lost wages over a woman's lifetime. He might also note that African American women are making only 64 cents on the dollar, and Latinas are making a shocking 54 cents on the dollar to men. The simple fact of the matter is that if we let the chips fall where they may, women make significantly less than men. Enough to impact their standard of living, their ability to buy a home, their ability to feed their families, their retirements, and literally every other part of our lives. To make matters worse - women who do stand up for a raise, contrary to Nadella's advice, are often punished for it. That make's Nadella's statement all the more damaging: without real change at the top, women alone won't be able to close the gap. This isn't news to anyone but Nadella, and we have a message for him: making less than your male peers isn't good "karma," it's injustice. Apologies without action are meaningless. If Nadella was serious about equality he could make salaries at Microsoft transparent, ensure pay parity for women and men, and bring Microsoft's family leave up to the industry standard set by companies like Facebook, Instagram, and Reddit. That's why UltraViolet members are speaking out now, and demanding that Microsoft fire Nadella and replace him with a CEO who will help close the gender gap, not just tell women to wait their turn. A half million dollars over the course of our lifetimes is nothing to joke about, and it can't be walked back with a simple apology. It's time for Microsoft to commit to ending the gender wage gap: and that means Nadella has got to go. Nita Chaudhary and Shaunna Thomas are co-founders of UltraViolet, an online community of more than 550,000 women and men who want to take collective action to expose and fight sexism in the public sector, private sector and the media.